Here it is the Canada’s Victoria Day long weekend. Last year on this weekend I was off cycling the Golden Triangle with a group from the Edmonton Bicycle and Touring Club (EBTC). This year I am at home , with garden clean-up at the top of my plans. Cycling is however also in my plans. I am glad that I am not riding the GT or the Silver Triangle that EBTC members are doing this year. Not that I wouldn’t love to be out touring. The fact is though that I just haven’t been cycling enough this year yet to be able to handle 100K days and mountain passes. I have yet to even get my touring or road bikes prepped for riding – but sometime this weekend that will happen. 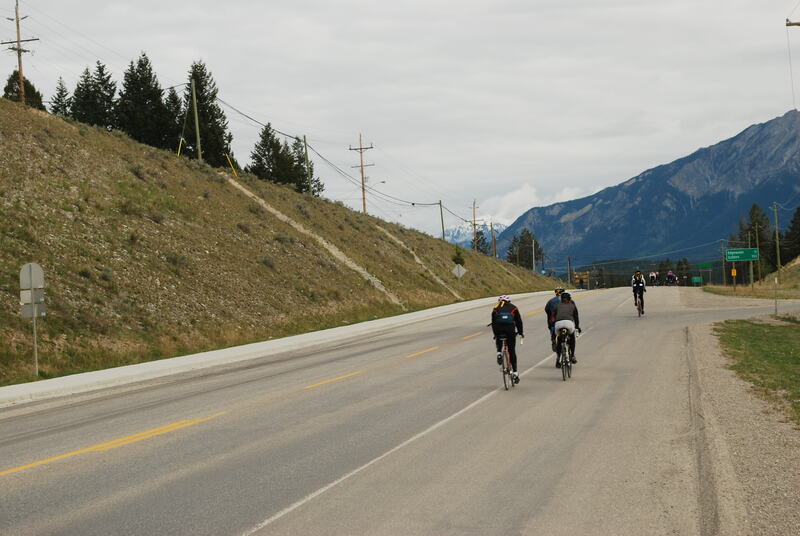 The final day of the 2010 Golden Triangle on May 24th would take us from Golden B.C., through the Kicking Horse Pass, back to Castle Mountain Junction in Banff National Park. It was a beautiful morning that greeted us – sunshine and blue skies. After a quick breakfast out behind Mary’s Motel where we had spent the night, we were off. My knee felt good enough to start the day but I told myself that if it got bad I’d call it quits and hitch a ride in our support van. As for my bike, I was still missing 4 of the 5 bolts holding my chain rings on but it seemed secure enough to give it a try. If I had mechanical difficulty I had decided I would end my ride. It was a short ride to the edge of town, onto the Trans-Canada highway and the climb began. Even though traffic was busy (far busier than on the previous day’s ride), it was still early (7:30) and the highway had a nice shoulder for most of the climb, so the ride was non-stressful. And climb we did – it was about 21 km from Golden to the top of this climb. This included a couple of level stretches but basically it was low gear climbing for over an hour. 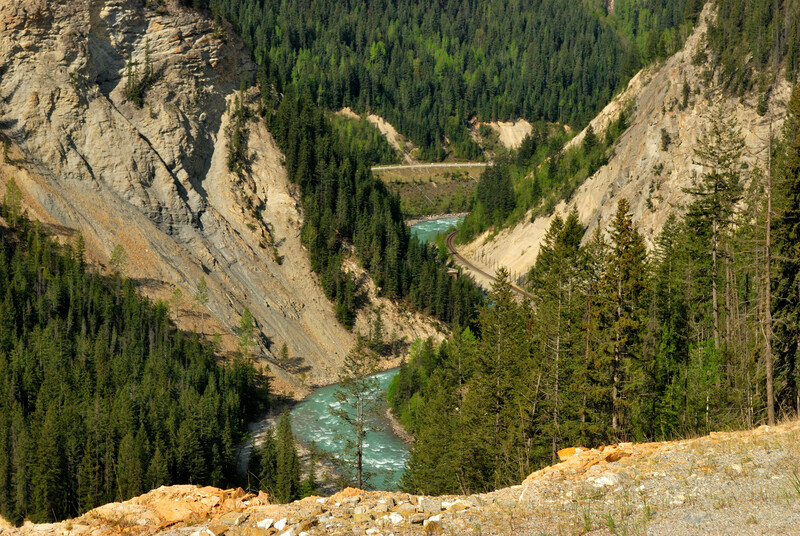 There was some great scenery on the way up as the highway progressed along the steep edge of the Kicking Horse River Canyon. Another 3 km and we reached the summit and then another 4 K and we were into Yoho National Park. This was a beautiful section of the ride – beautiful snow capped mountains wherever one looks and a good shoulder on the road so that it is safe to take in a bit of the scenery. 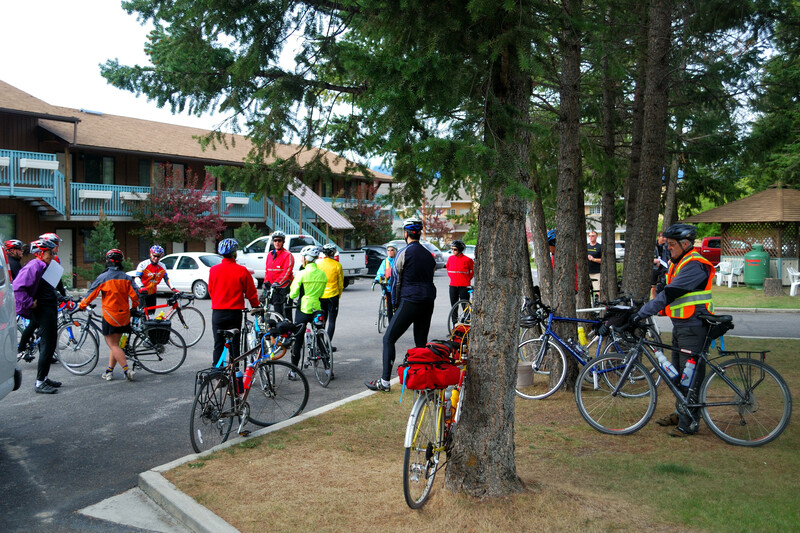 Most of the time the EBTC rest stops would be at a different location from the stops for the much larger EVCC contingent, but in this case they were at the same picnic area. 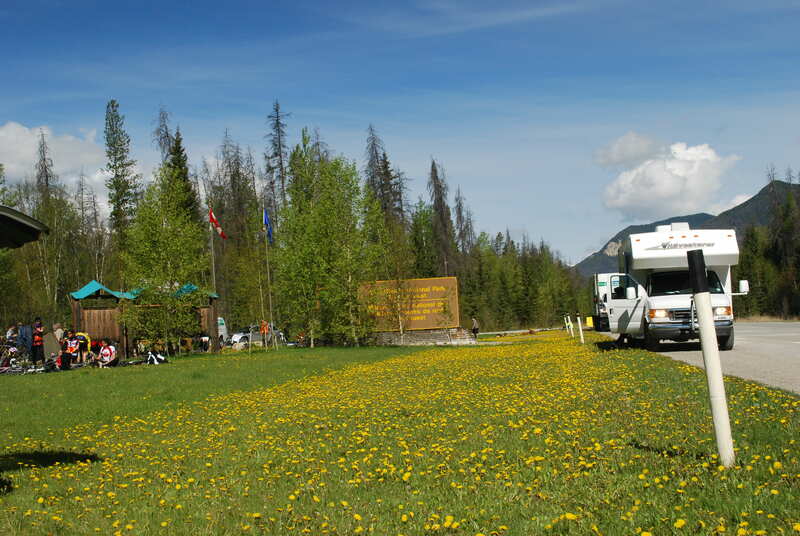 It was another couple of hours of beautiful mountain riding until we arrived at our lunch stop in Field B.C. It was a this point that I decided to call it quits to my day of riding. The previous hour had not been fun. Sure the air was fresh and the scenery was great but I had a pain in my knee with every pedal stroke. It would have been nice to say I covered the whole 300K distance on my own but I’ve done that before so that bragging point was not important. More important to me at this point was not incurring a long-term injury that could hamper my cycling plans for the upcoming summer. Perhaps amazingly, my other potential ride-ending problem, the 4 lost chain ring bolts, had not been an issue through the morning’s ride. So after making and putting down a couple cheese-on-bun sandwiches, I secured my bike to our support van with a couple of others who also decided to not ride any more that day. By this time the rest of our EBTC group was already well down the road. Leaving Field there was another climb, a major pass with a rise of 400m over the next 18K to the continental divide and the border between Yoho and Banff National Parks. Trying to take photos from a moving van certainly reminded me of why I prefer to cycle. On the bike I can stop virtually anytime, anywhere (particularly on these park roads with generous shoulders). In a motor vehicle you have to stop at a designated viewpoint, picnic ground, etc. Even if the shoulder and the traffic levels would allow one to stop between these sites there is still the fact that by the time you stop you’ve traveled some distance from the point at which you might have seen something that inspired a photo. While my first thought is to say that I am sure glad I wasn’t on my bike at this time, that would be a bit of an over-dramatization. 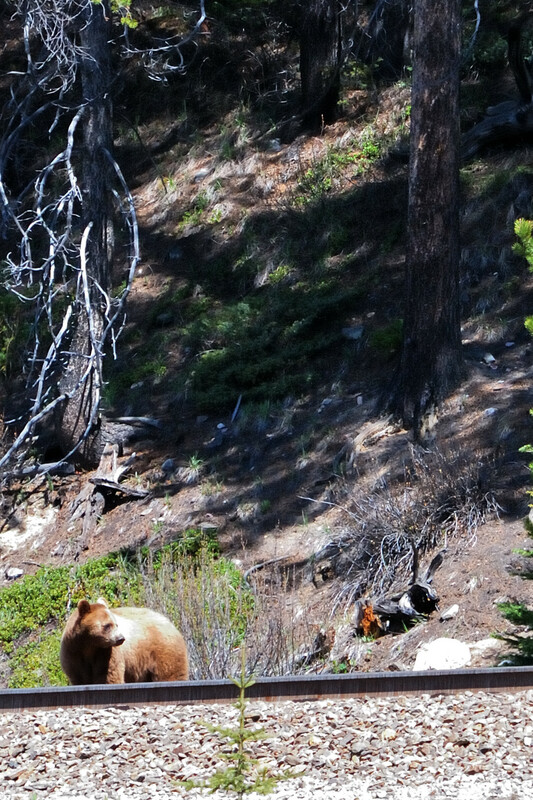 This bear looks close (thanks to a telephoto lens and image cropping) but was a long way (200-300 m?) from the highway – up a slope by some railway tracks – and paying no attention to the dozens of people watching him. 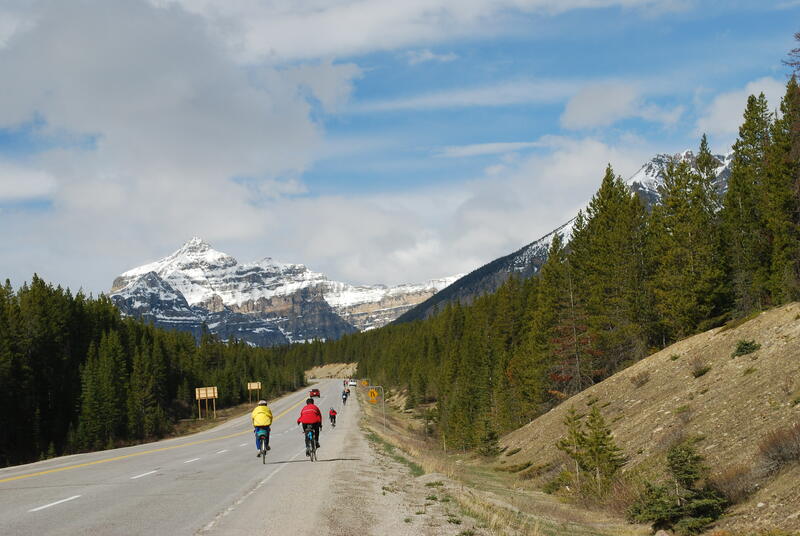 Leaving Lake Louise, the cyclists turned onto the quiet old highway, the Bow Valley Parkway, for the final 25K of the trip. 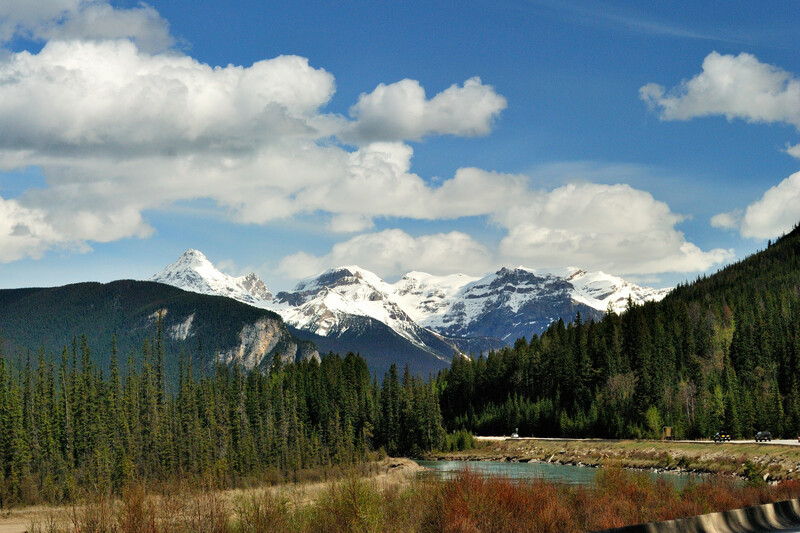 While the ride into Lake Louise had been on the traffic-laden main highways, the Bow Valley Parkway runs parallel to the main highway with little traffic, through a shading and aromatic evergreen forest. I regretted not being able to ride this stretch. 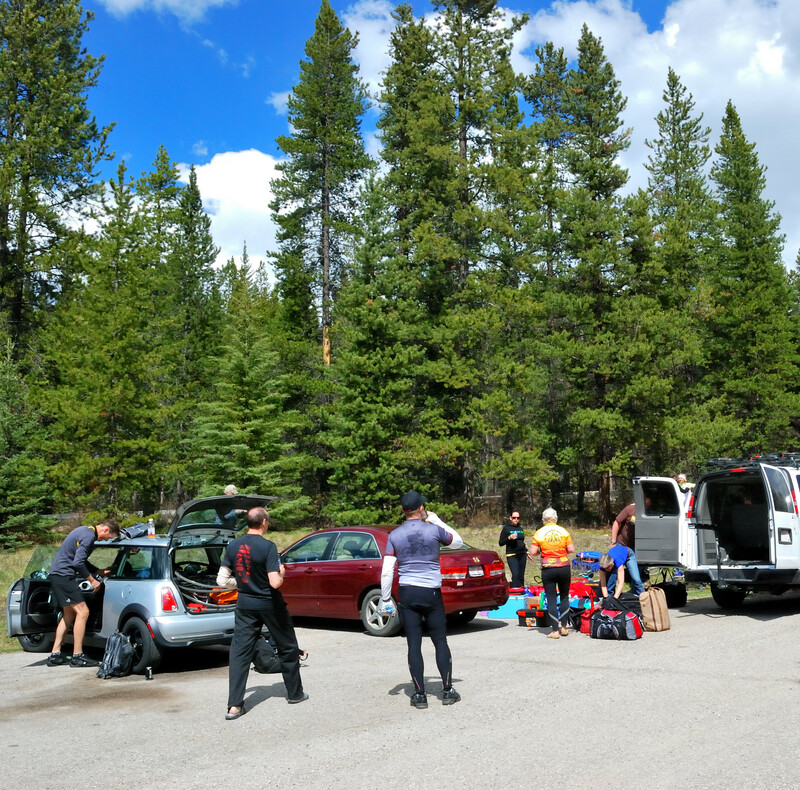 By 2:30 on this Monday afternoon we were back at our vehicles at the Golden Triangle starting point at Castle Mountain Junction. 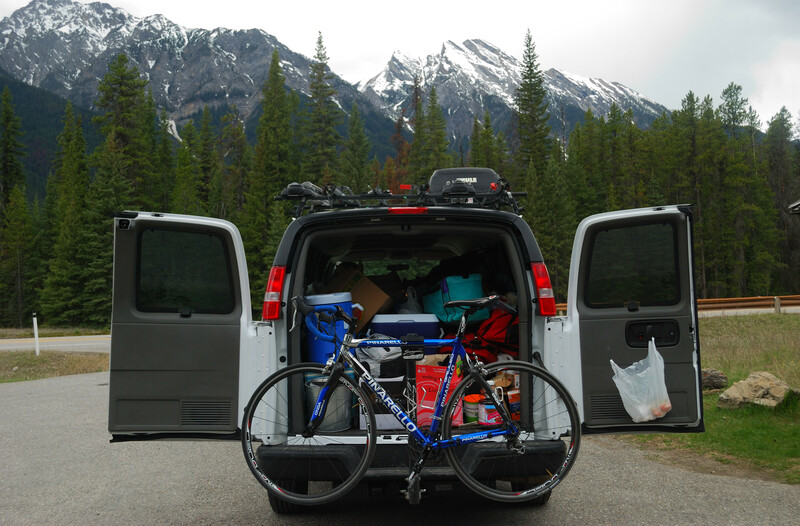 I collected my gear and bike from the van and loaded everything into my car. After farewells to my new EBTC friends, I was back on the road for the 5 hour drive back to Edmonton – happy to have participated in my first cycle tour in a number of years – and already planning for the next one. To see more of my photos from this day, please visit my Facebook album. Day 2 of the ride started off good. 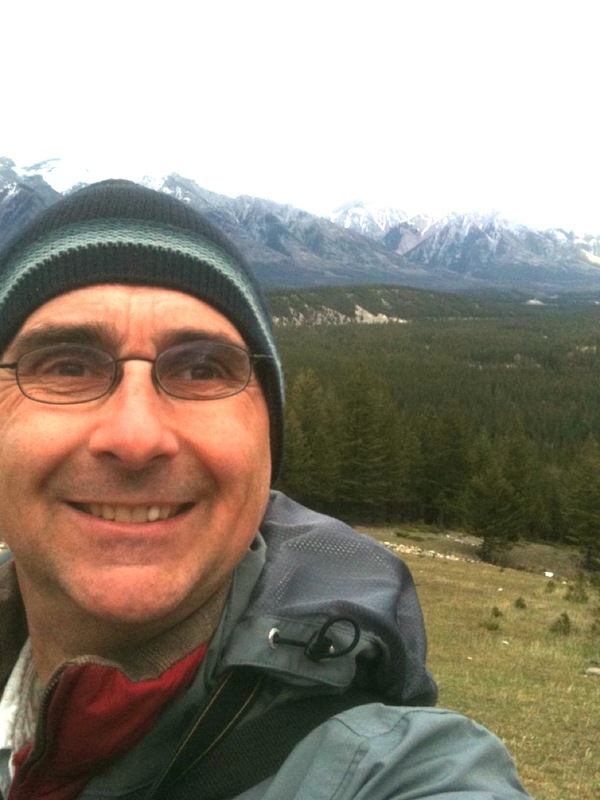 After a soak in the Radium hot springs the previous evening and then a good night’s sleep I was ready to go. first of course we fueled up at a good communal breakfast. I think we were pulling out of the motel parking lot around 8:45. The weather was cool (single digits) but dry. Wearing long pants and a jacket over my long sleeve jersey, I was very comfortable. The ride north from Radium to Golden is just a little over 100K and relatively flat(some climbs but no mountain passes). 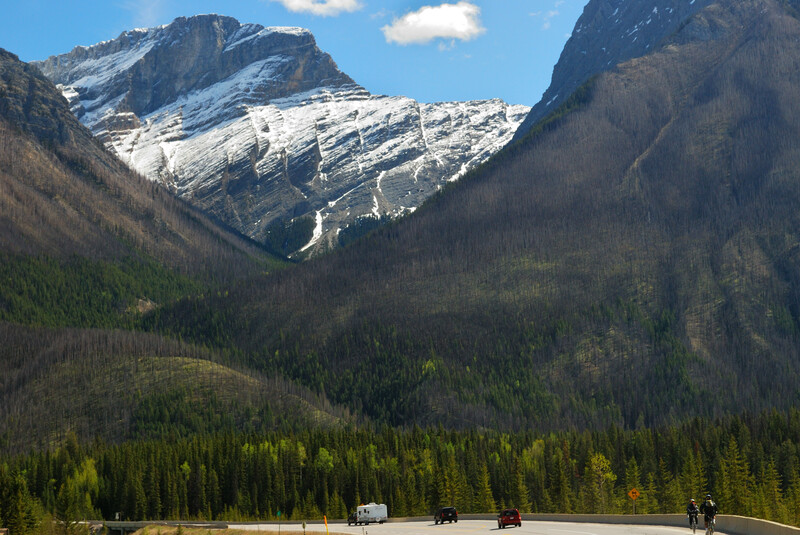 Highway 95 follows the valley between two mountain ranges providing mountain scenery without the climbs. 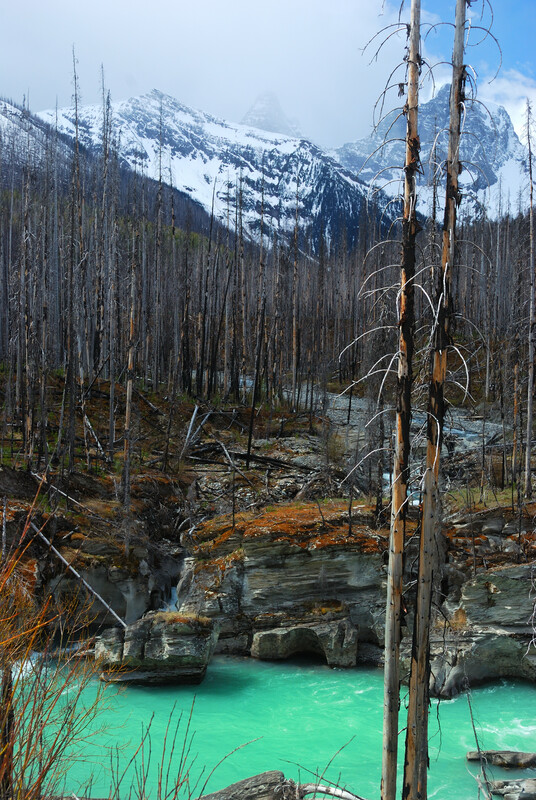 In the valley is the Columbia river which is broken up into many channels and picturesque little lakes. The terrain beside the road is mainly rangeland and farmland. It was rural but not wild country one wouldn’t go very far before seeing a driveway leading to a house set back from the highway. Between the 20-some riders with the EBTC and the 300 with the EVCC there were a lot of cyclist on the road this day but it was never crowded. Towards the end of the day I would ride many kilometers before catching or passing another cyclist. The day was peaceful, enjoyable and eventful (except for one story yet to come). I stopped many times to take photos along the way (which made it a little difficult to keep up with the group (I think I did slip to the back of the back). I was not helped by a knee pain that developed about mid day and got progressively worse. This is not a chronic injury nor could I trace it to any specific incident, so I just kept moving along and using photo stops to settle the knee down. 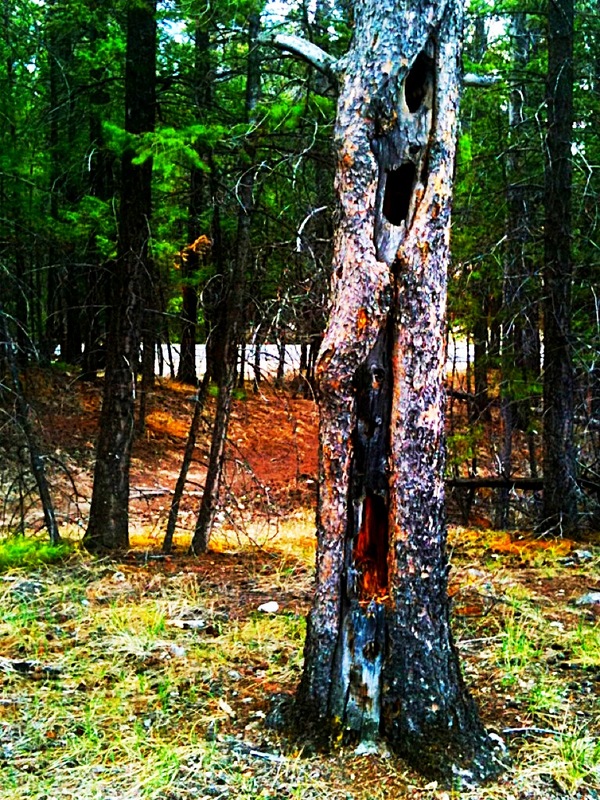 Along the route I would see a black bear down by the river. It was a fair distance (a few hundred meters) away and across the road, down a hill on the other side of dual railway tracks and across a hundred meters of marsh, so there was never any worry of an encounter. 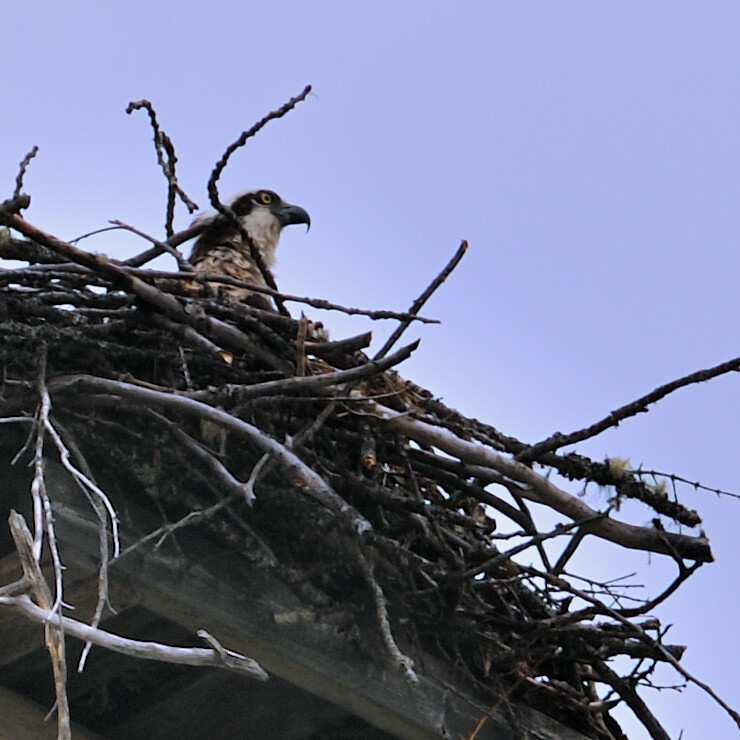 I was also fortunate to see a young (but large) bird-of-prey (not sure what kind) in a nest – pretty cool! I stopped for awhile to watch as the mother left the nest, presumably on a hunting expedition while the baby remained in the nest squawking. It is interesting to note that his nest was not in a natural habitat but rather located at the top of a pole that had probably been set up to provide a nesting habitat. By late afternoon, I was pretty alone on the road – there were a few others but not many. My knee continued to hurt but I soldiered eventually using my good leg for most of my power. Also late in the afternoon my crank developed an annoying creak. With my knee hurting I didn’t feel like stopping to check out the crank – another 20km or less and I’d be in Golden and then could assess the situation. 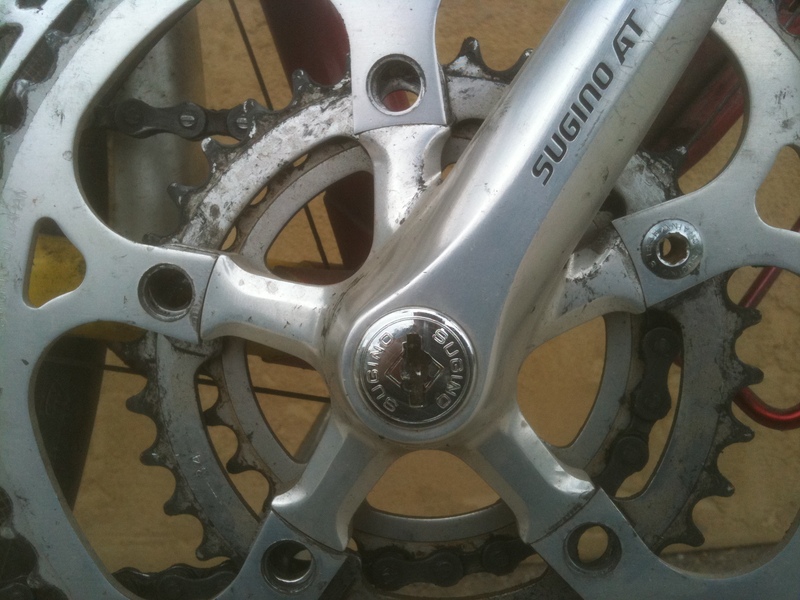 Unfortunately as I was going up one hill I discovered that I couldn’t shift my front derailleur properly and when I looked down I discovered that my large chainwheel was wobbling. Still I figured i could carry on with just my smaller chainwheel – just a little farther to go. Then my chain fell off and I had to stop to fix it. At that point I looked more closely at my crank and chainwheels. I discovered that a bolt that holds the chainwheels together was lose – no it was missing! Looking more closely I discovered I wasn’t missing just one of the bolts but two … three…four of the 5 bolts! How could that happen?! Anyway I got out my tools, tightened up the remaining bolt very securely, left my chain on the small inner chainring and hobbled on into Golden. I found the motel we were staying at, caught up with the group, cleaned up and had a great dinner. 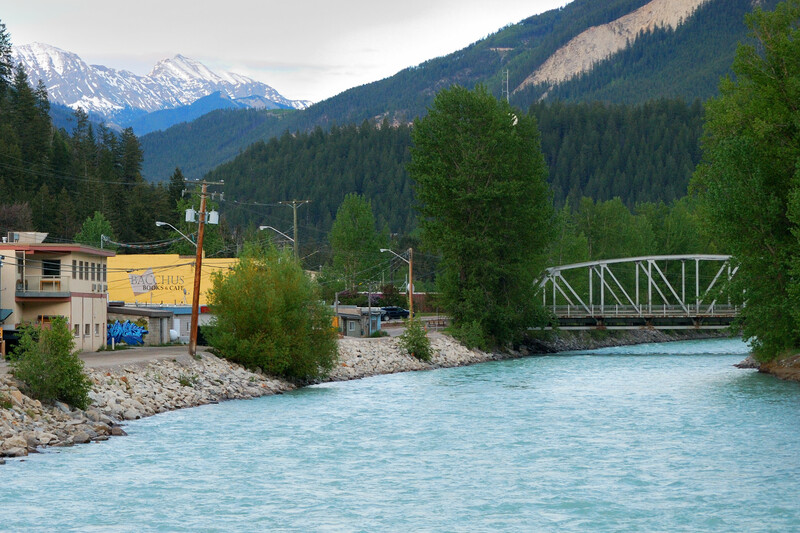 Kicking Horse River in Golden B.C. As I marked the end of Day 2 I was thinking ahead to the next day, wondering if my bike and my knee would be up to some serious mountain passes on the return to Castle Mountain Junction. The day starts early, up by 7-ish. I’m excited, I’ve waited for this day for sometime: a couple of months if you count from when I decided I would ride this year’s Golden Triangle (or 23 years if you count from the last time I cycled this route). We have a group breakfast in the hostel dining room although at this point I don’t really feel a part of the group and I don’t think most of the other EBTC riders had any idea that I am even with them. A quick clean-up of dishes and then the bikes and equipment are loaded up for the drive to the starting point: Castle Mountain Junction. I was not exactly sure where to go so I try to follow the group van – but I eventually lose it in the traffic. I then direct my attention to keeping an eye out for the Radium turn-off, which I easily find and then turn into the Castle Mountain Junction hostel parking lot. After a climb of about 7K we reach the first summit for the day and 4K later we cross the Continental Divide, the border between the provinces of Alberta and British Colombia. 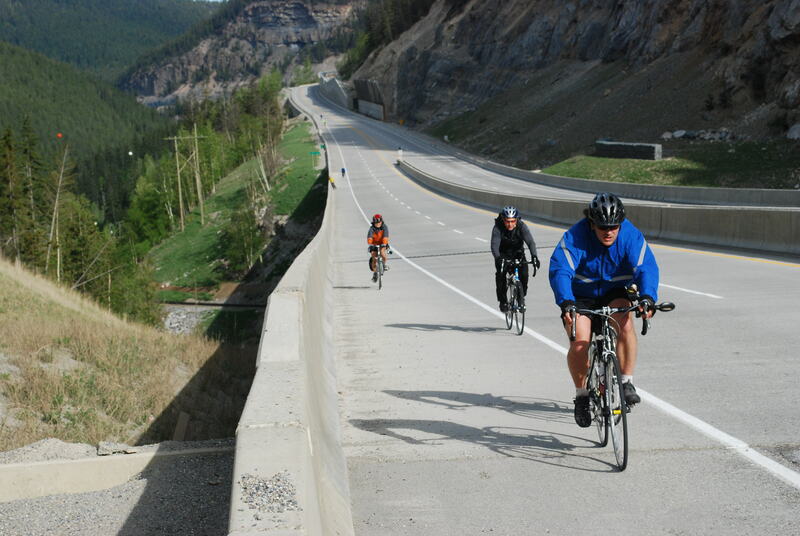 Through this stretch, the vehicular traffic is fairly light but there are many bikes on the road – primarily due to the 300 members of Calgary’s Elbow Valley Cycling Club that are running their own Golden Triangle ride simultaneously along the same route. Our group lunch stop was at Vermillion River Crossing at about 40K, I am the second last in our group to arrive but I keep telling myself that it is not a race and I want to take advantage of the journey to take lots of photos (at least some of which will be references for paintings). The after-lunch section is relatively flat. 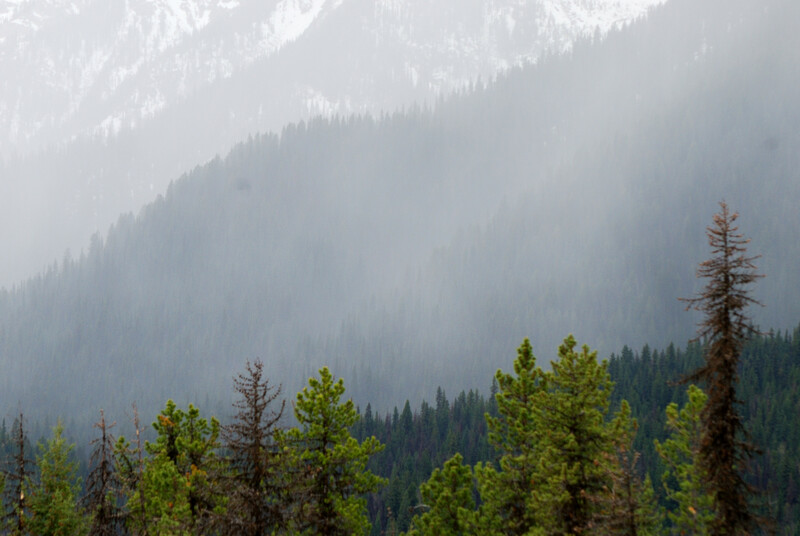 The weather is coolish with a bit of drizzle and a few flakes of snow. This turns out to be a very solitary section of the route in which I see very few other riders. I do pass a couple of deer but do not stop for too many photos. 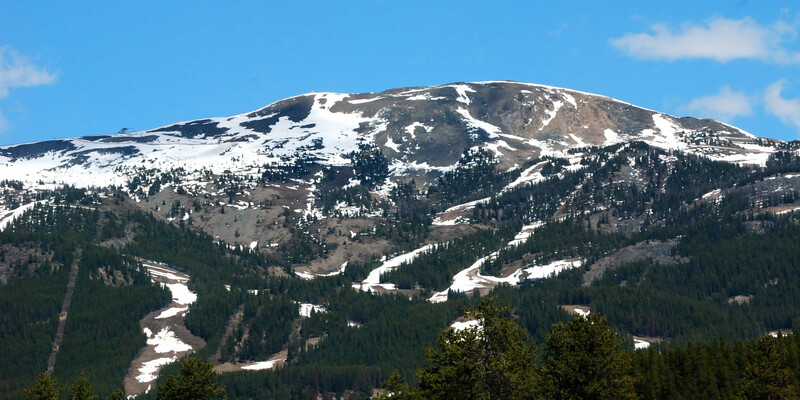 Another 3K uphill after the rest until we begin the big descent into Radium. It is a long downhill. It may have been hard work pedaling uphill but with the traffic and narrow lanes is not at all relaxing going down – riding one’s brakes with full concentration is required. After a short ride through town we reach the Bavaria Motel, check in to our rooms, relax a bit in the sun and have a wonderful spaghetti dinner in the Gazebo. 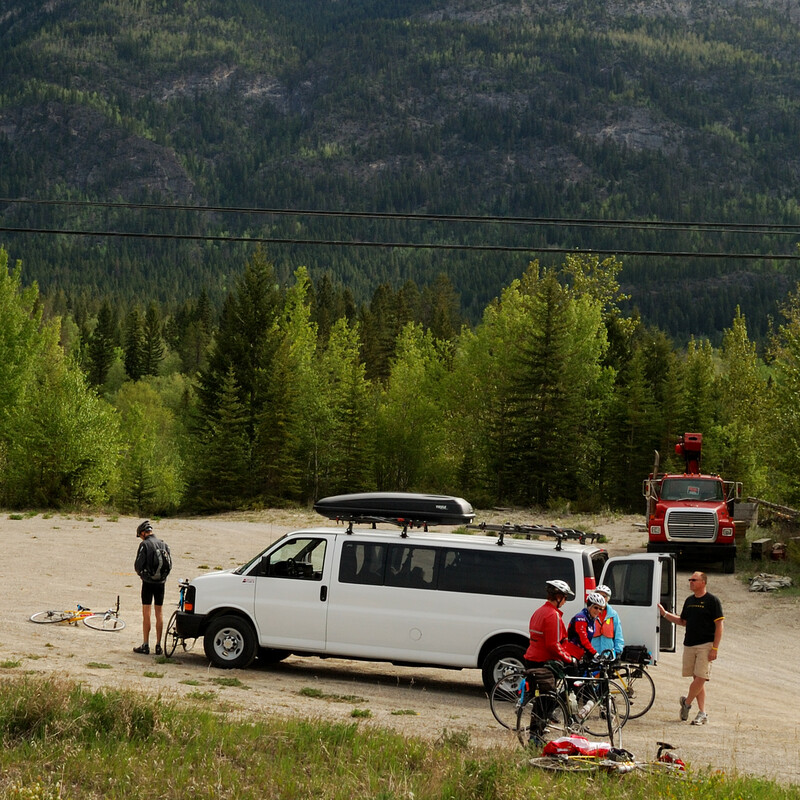 That evening a ten of us pile into the van for a short drive up to the Radium Hotsprings where we enjoyed a relaxing soak for an hour or so. I must have been pretty tired and relaxed because once back at the motel I fell asleep quickly. To see more photos from this first day of the 2010 Golden Triangle click here. Day 0 (Friday May21st) – The day finally arrives to get this journey underway. 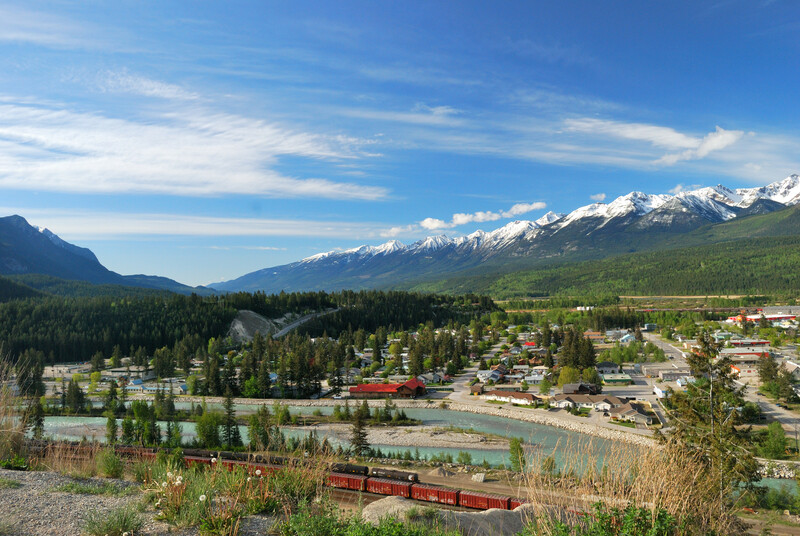 This is the day for final packing and getting to Banff to begin a long weekend bicycle tour – the Golden Triangle: Banff – Radium – Golden – Banff. 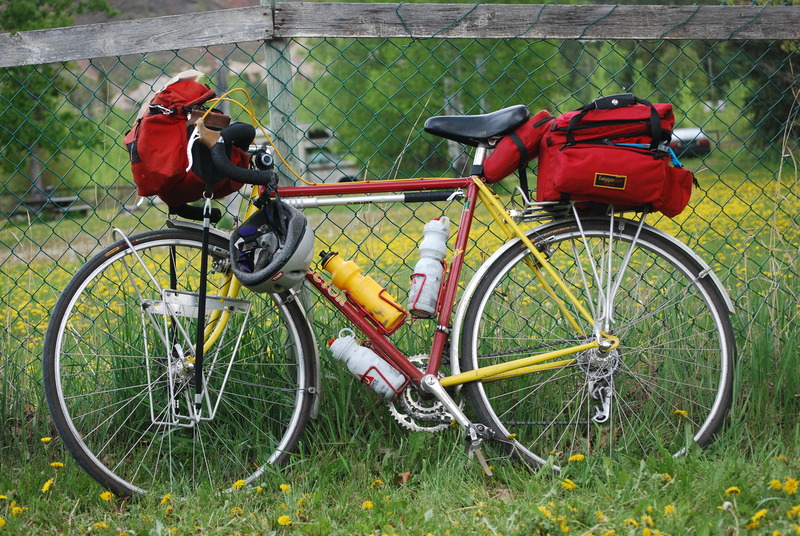 I loaded up my gear into my panniers, removed the front wheel of my touring bike and maneuvered it through the trunk into the back of my Toyota . As planned, I hit the road just after noon and drove south in the rain for an hour and a half until I reached Red Deer. After a quick lunch break at the A&W, I continued my drive towards Calgary. At the north edge of the city I took the new highway 201 which skirts around northwest Calgary avoiding the delays of the old route through the centre of town. 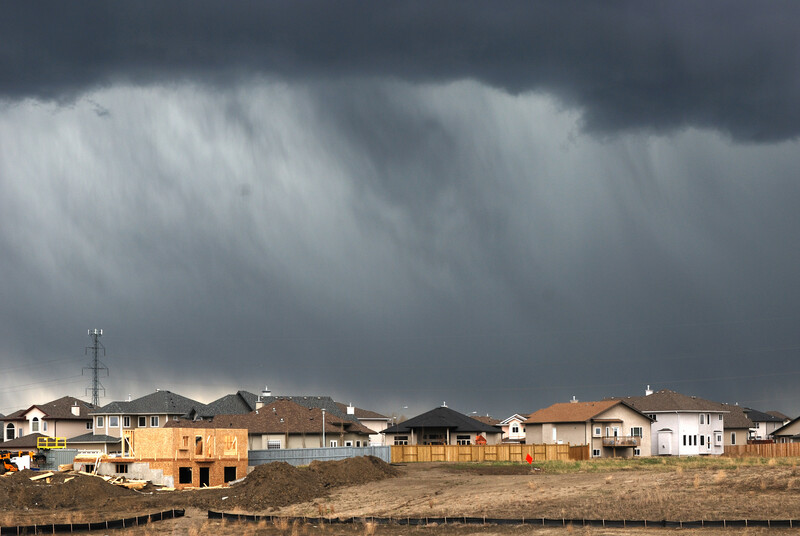 By the time I got through Calgary the skies were mostly blue and sunny. Highway 1 took me through to Banff where I arrived around 5:30. I found the hostel, got my key and settled in. I spent some time that evening walking in the vicinity of the hostel taking photos with my iPhone & Nikon D80. It was a rather chilly evening (around freezing?) so I broke out my toque and was glad to have a down vest with me. After walking around fro an hour I headed back to my room and amused myself by creatively processing some of the iPhone photos I had taken. Later in the evening, 9:30ish many of the others in our cycling group arrived at the hostel, although at this point I still didn’t know most of them. Hoping that it wouldn’t be too cold or wet in the morning, I called it a night. 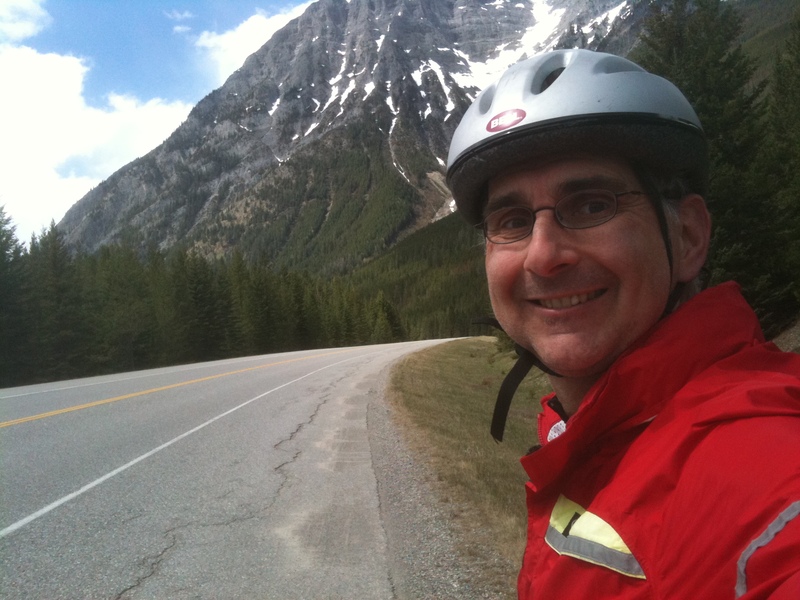 Sunday May 9th – A 60K ride bike riding in Northeast Edmonton . It was a cool blustery afternoon with threatening skies, some rain, gusty winds. The first 10K on the way to Rundle park was ridden in the rain. I was going to turn around if it didn’t stop by the 10K point, but it did and I continued North. After cycling up through Hermitage I got on to Meridian Street and followed it up until it intersected the Old Fort Road which I then took until it hit Manning freeway. From there I put in a few kilometers heading north on highway 28A . I thought I was doing well until I turned around and had to ride into the wind. It was a struggle heading home and I probably pushed a but too hard and exhausted myself. 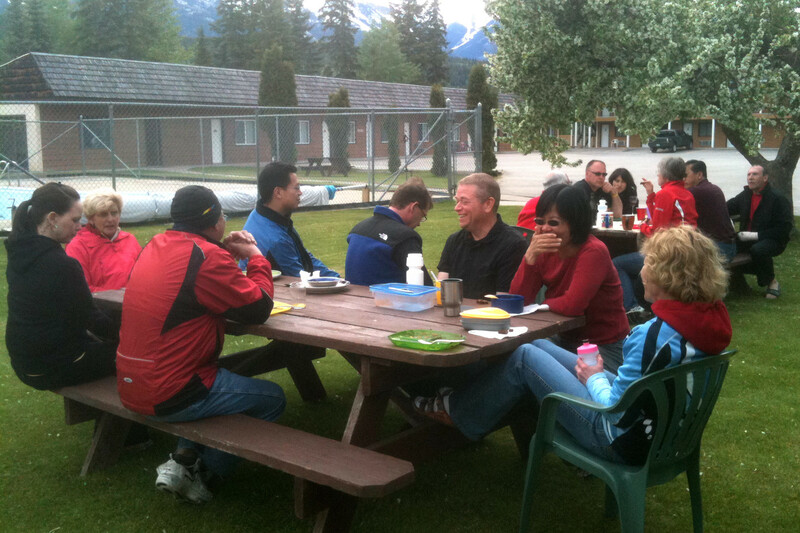 Monday evening May 10th – a 40K ride up Mill Creek ravine, past the velodrome and south into Mill Woods. It was a lot cooler evening than I expected. I was chilled and very glad I had my windbreaker with me for the return ride. This day’s 40K means I had done 150K over three days. Not bad but in two weeks I will have to be doing double that distance – and in mountain terrain. Tuesday May 11 this was the organizational meeting for the EBTC Golden Triangle Tour. It was very interesting and a bit intimidating to walk into the meeting room (a few minutes late due to the challenge of finding a place to lock up my bike at the hostel). I wished I knew some of the people there but I’ve been away too long. I was pleasantly surprised by the age of the group – in other words, only a handful I would readily say are much younger than me – lots of gray hair in the crowd. Wednesday – another rest day just a short 14 K roundtrip to MEC for the EBTC club night. Picked up a few supplies for the Golden Triangle trip including rain boots, extra gloves, safety vest and ??? Thursday May 13th – An evening ride, a pleasant 40K out southwest to and beyond Terwilligar. Saturday May 15 – One week before the trip and my goal was to do a 100 Km in one day not so much for training at this point as to prove to myself that I could do it. It was a beautiful morning except for the smoke in the air from forest/ brush/grass fires northwest of the City. 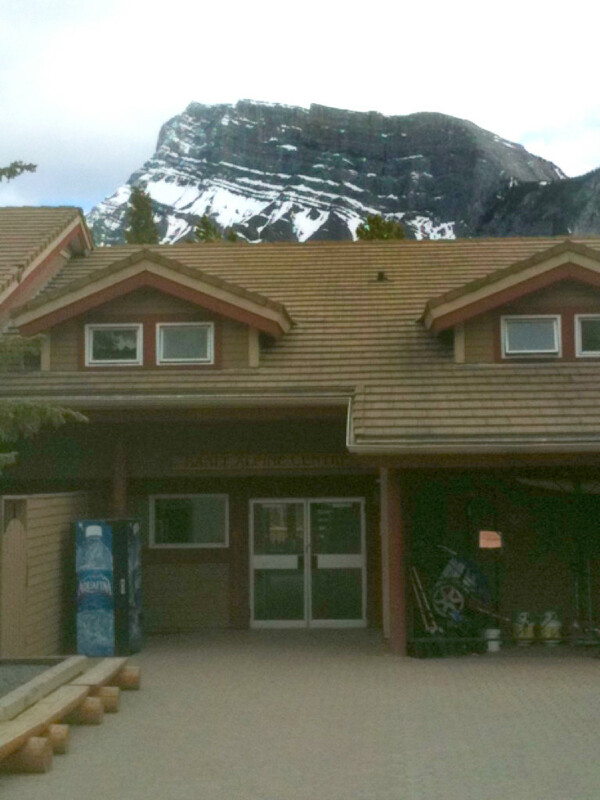 I started with a 30K trip up through Rundle and Hermitage parks leaving at 8:45 in the morning and taking about an hour an a half. I stopped briefly in Rundle park to take a few photos of the ponds and the geese. The second leg of the day began at 11AM and took an hour 40 minutes. This was another 30K journey, this one south through Mill Creek ravine and on to Mill Woods. At 4:30 in the afternoon I began the third and final leg – a 40K trip southwest through the river valley to Terwilligar. About 10 K into this ride I was feeling burnt out but after a bit of an energy bar and some water I came around and completed the ride with ease. I arrived home just before 7PM, achieving my goal of a 100K day. Most importantly, although I felt pleasantly tired I did not have any significant pain – my neck was okay, my wrists were fine as were my Achilles tendons and calf muscles – All very encouraging and filling me with confidence for being able to complete next weekend’s Golden Triangle. Week 7 of my Golden Triangle preparation ends with a very pleasing 243K which gives me 828 for the seven weeks. I’d originally penciled in 1000K as my pre-Triangle goal but I will probably come a little short as I will want to taper in the coming week. Yet another cool week with little riding. On Sunday May 2nd I started the week with a 45K ride up through McKinnon ravine and along the top of the river bank then out to the west end through the residential streets. The week was wiped out for cycling as Tuesday saw 10-15 cm of snow fall and the rest of the week temperatures were well below normal (highs in the low single digits). On top of this my sore right calf muscle was getting worse and I was not able to walk normally and feared I wouldn’t be able to cycle either. On Saturday May 8th I went out for a 50K ride south through Terwilligar. This ride was a test of my calf muscle. It was okay for cycling as long as I didn’t get out of the saddle to power up hills. Staying in the saddle in a low gear with minimal ankle action worked well. So week 6 ends with just 95K of cycling to give a six week total of 585 Km – only three weeks until the start of the Golden Triangle!